Bitters in gravy? A splash of Angostura bitters adds a deep layer of flavor that’s amazing — a rich nuance that could change the way you make gravy from now on. Here’s my favorite wintertime roast beef. In addition to the gravy, the meat itself is enhanced with an olive oil-bitters rub, then browned on the stovetop before roasting. If you have your own favorite gravy, whether it’s roast beef, lamb, pork or poultry, try a few drops of Angostura to add a delicious, rich flavor dimension. Preheat oven to 425°F. Combine 1 tablespoon olive oil with 1 teaspoon Angostura bitters. Rub all over roast. Sprinkle meat generously with salt and pepper. Heat another tablespoon olive oil in a small roasting pan on the stovetop. Brown meat on all sides over medium heat. Add onion, garlic and water to pan. Roast, uncovered, 45 minutes or until cooked as desired. Internal temperature should be 145ºF for medium-rare meat, 160ºF for medium, and 170º F for well done. 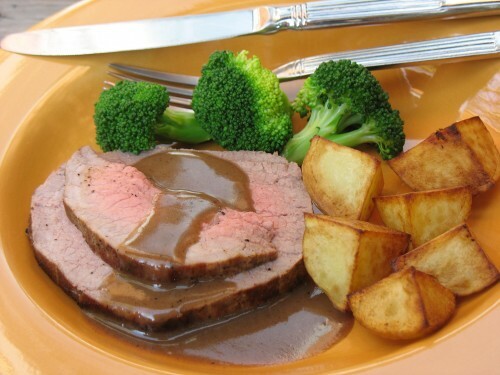 While beef roasts, combine broth, 2 tablespoons flour, remaining 1 teaspoon bitters, and brandy; stir until smooth and flour is dissolved. When meat is done, remove from pan to a serving platter; cover with foil to keep warm. Remove onion and garlic from pan with a slotted spoon and discard. Place pan on stovetop over medium-high heat. Add broth mixture and stir constantly with a wire whisk, scrapping browned bits from bottom of pan. Continue to stir until gravy has thickened. For thicker gravy, add a 3rd tablespoon flour to 1/4 cup water; stir until smooth. Stir a tablespoon or two of the hot gravy into this mixture, and then whisk into roasting pan. Continue stirring until gravy thickens more. Serve with sliced roast beef. What a great idea to use bitters in the rub. I’m over–due for making a roast so this recipe is on my short list! The rub sounds so good on beef. Have you tried it on roast chicken? When Bernie saw your photo he asked how soon can I make this recipe! Ha ha! Lou was the fortunate recipient of that recipe testing project. That would have been fun 😮 But then there may not have been leftovers! Leftovers are what I live on — don’t have to cook the next day!